Giunta, T., Devauchelle, O., Ader, M., Locke, R., Louvat, P., Bonifacie, M., Métivier, F., Agrinier, P. (2017) The gravitas of gravitational isotope fractionation revealed in an isolated aquifer. Geochem. Persp. Let. 4, 53-58. ANR CO2FIX (ANR-08-PCO2-003-03) and the IPGP/Ademe/Schlumberger/Total CO2 geological storage program. Craig, H., Horibe, Y., Sowers, T. (1988) Gravitational separation of gases and isotopes in polar ice caps. Science 242, 1675–1678. Severinghaus, J.P., Bender, M.L., Keeling, R.F., Broecker, W.S. (1996) Fractionation of soil gases by diffusion of water vapor, gravitational settling, and thermal diffusion. Geochimica et Cosmochimica Acta 60, 1005–1018. Severinghaus, J.P., Sowers, T., Brook, E.J., Alley, R.B., Bender, M.L. (1998) Timing of abrupt climate change at the end of the Younger Dryas interval from thermally fractionated gases in polar ice. Nature 391, 141–146. ). Yet, in a motionless and chemically homogeneous water column, dissolved isotopic substances must be distributed according to their masses. Here we report the first resolvable isotopic variations resulting from gravitational effects on solutes, identified on dissolved chloride (Cl-) and bromide (Br-) in a sedimentary aquifer from the Illinois Basin (USA). 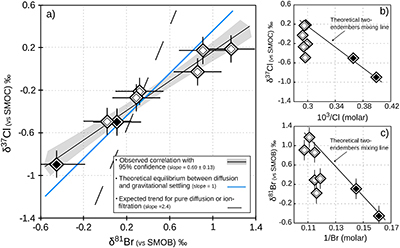 We show that the correlations between depth and both 37Cl/35Cl and 81Br/79Br – varying by 1.1 ‰ and 1.6 ‰ respectively – reflect the evolution toward a gravity-diffusion equilibrium of porewater in the sediment column. This observation reveals that these deep groundwaters have been mostly stagnant for at least 20 Myr, possibly up to 300 Myr. As chloride and bromide are often conservative in groundwater systems, we highlight their essential role in unravelling the hydrodynamics and residence times of isolated aquifers. Furthermore, this study reveals gravitational fractionation as a viable process, potentially affecting other isotopic systems in various geological settings. Table 1 Porewaters sampled at nine discrete depths within the MSS from a single, multi-level observation well. All data except the δ37Cl and δ81Br were measured at the ISGS (Panno et al., 2013; Labotka et al., 2015). δ37Cl and δ81Br were measured at IPGP. Errors are reported in 2σ. Figure 1 Isotope ratios and concentrations co-variations in the Upper (black diamonds) and in the Lower units (white diamonds). δ37Cl and δ81Br are apparently linearly correlated (R2 = 0.95) throughout the MSS (a). This linear correlation cannot be attributed to mixing between the Upper and Lower porewaters given the absence of inverse correlation with concentrations (b,c). Instead, this correlation is explained by gravitational settling affecting both systems. Errors are 2σ. Figure 2 The gravitation-diffusion equilibrium slope dependence on temperature. When z is sufficiently small, Eq. 1 might be simplified to a first order approximation such that where the enrichment of the isotopic ratio is therefore linearly correlated to depth. This approximation attests that for a given isotopic system, the slope of the equilibrium will only depend on the temperature. We report Cl- and Br- concentrations (a,c), as well as δ37Cl and δ81Br (b,d) from the Lower unit aquifer, together with equilibrium enrichment profiles calculated for temperatures of 50 °C (actual temperature of the formation) and of 130 °C (cementation temperature; though highest temperature reached during burial was probably closer to 150 °C). Given the scale of the concentration plots (a,c) 50 °C and 130 °C equilibrium profiles are not distinguishable. Error is 2σ. Figure 3 Concentrations and isotopic distributions for Cl (a,b) and for Br (c,d) reported with depth in the MSS. EC is the Eau-Claire Shale and PC is the Precambrian basement. We hypothesise the following scenario: 1) An all homogeneous (in concentrations and in isotope compositions) motionless fluid in the MSS (thin black line). 2) The cementation of the Middle unit occurred relatively rapidly, before equilibrium is reached throughout the entire MSS (dashed line). 3) Disconnected Upper and Lower aquifers then separately pursue their evolution toward equilibrium (blue shaded areas). The concentration decrease in the Upper unit (a,c) is then resulting from a dilution event (as proposed by Panno et al., 2013) which must have occurred after stage (2). Figure S-1 Gravity settling of chlorine in a still aquifer. (a) Evolution of the concentration profile. (b) Relaxation of the amplitude of the concentration profile C(z = 0) − C(z = h). Equilibrium corresponds to Eq. S-4, Fourier mode to Eq. S-19, and numerical simulations to Eq. S-11. Parameters estimated for the LMS aquifer (Table S-1). Table S-1 Quantities used in A.4. Brackets indicate typical range. Table S-2 This Table is similar to the one presented in the main text (Table 1). 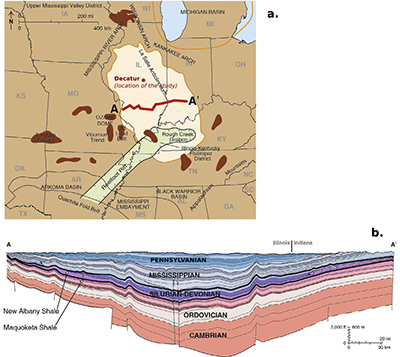 In addition we added the Cl and Br concentrations and isotopic compositions measured in the Ironton-Galesville Sandstone, the Cambrian formation covering the Eau-Claire Shale. Isotopic data are reported versus Standard Mean Oceanic Chloride and Bromide, respectively. Error is 2σ. Figure S-2 The Illinois Basin (bright coloured) and the different geological structures surrounding it. Decatur is the location chosen for the CO2 sequestration project and is therefore the location of the multi-level observation borehole where porewaters were sampled. (b) Geological cross section of the Illinois Basin between A and A’. The Mount Simon Formation corresponds to the deepest strata of the Cambrian units. Figures modified after Panno et al. (2013). Figure S-3 Stratigraphic column from the igneous basement to the Ironton-Galesville Sandstone and the approximate depth for each different unit. Red circles indicate the depth at which porewaters were sampled in the course of the Decatur Project. Figure modified after Labotka et al. (2015). Figure S-4 White diamonds are referring to samples from the Lower Mount Simon (LMS), black diamonds are referring to the samples from the Upper Mount Simon (UMS) and grey circles are referring to IG. We reported the isotopic compositions versus the inverse of the concentrations. Here we also plotted the data for the Ironton-Galesville formation, in order to show that Ironton-Galesville brines cannot neither be associated to any possible mixing with any of the units from the Mount Simon Sandstone. Marty, B., Dewonck, S., France-Lanord, C. (2003) Geochemical evidence for efficient aquifer isolation over geological timeframes. Nature 425, 55–58. Clark, I.D., Al, T., Jensen, M., Kennell, L., Mazurek, M., Mohapatra, R., Raven, K.G. (2013) Paleozoic-aged brine and authigenic helium preserved in an Ordovician shale aquiclude. Geology 41, 951–954. Holland, G., Sherwood Lollar, B., Li, L., Lacrampe-Couloume, G., Slater, G.F., Ballentine, C.J. (2013) Deep fracture fluids isolated in the crust since the Precambrian era. Nature 497, 357–360. Lippmann, J., Stute, M., Torgersen, T., Moser, D.P., Hall, J.A., Lin, L., Onstott, T.C. (2003) Dating ultra-deep mine waters with noble gases and 36 Cl, Witwatersrand Basin, South Africa. Geochimica et Cosmochimica Acta 67, 4597–4619. Russell, W.L. (1933) Subsurface concentration of chloride brines. AAPG Bulletin 17, 1213–1228.
) and present the first evidence that isotopic ratios can be affected by this process, providing a new tool to constrain the degree and timing of isolation for sedimentary aquifers. Pytkowicz, R. (1963) Gravity and the properties of sea water. Limnology and Oceanography 8, 286–287. Mangelsdorf, P.C., Manheim, F.T., Gieskes, J.M.T.M. (1970) Role of gravity, temperature gradients, and ion-exchange media in formation of fossil brines. AAPG Bulletin 54, 617–626. Kharaka, Y.K., Hanor, J.S. (2003) Deep fluids in the continents: I. Sedimentary basins. Treatise on Geochemistry 5, 605. ). However, all these studies concluded that the effect on solute concentrations must be too minor to be detected, with for instance the equilibrium distribution of chloride (Cl-) resulting (see Supplementary Information) in a ~0.5 % concentration enrichment per 100-metres at 25 °C (i.e. within the typical 3–5 % analytical error on the determination of Cl concentrations). 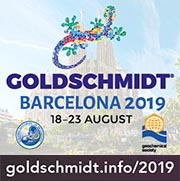 Godon, A., Jendrzejewski, N., Eggenkamp, H.G., Banks, D.A., Ader, M., Coleman, M.L., Pineau, F. (2004) A cross-calibration of chlorine isotopic measurements and suitability of seawater as the international reference material. Chemical Geology 207, 1–12. Giunta, T., Ader, M., Bonifacie, M., Agrinier, P., Coleman, M. (2015) Pre-concentration of chloride in dilute water-samples for precise δ37Cl determination using a strong ion-exchange resin: Application to rainwaters. Chemical Geology 413, 86–93. 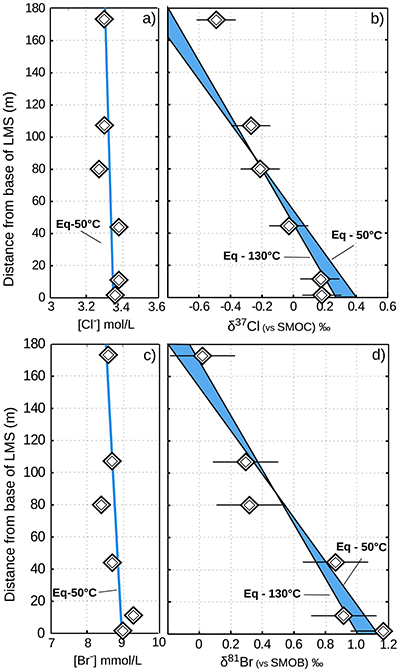 Louvat, P., Bonifacie, M., Giunta, T., Michel, A., Coleman, M. (2016) Determination of bromine stable isotope ratios from saline solutions by “wet plasma” MC-ICPMS including a comparison between high-and low-resolution modes, and three introduction systems. Analytical Chemistry 88, 3891–3898. ), for 2σ. To identify such fractionation in a sedimentary aquifer therefore requires a high resolution multi-level sampling of the porewater column. Freiburg, J.T., Morse, D.G., Leetaru, H.E., Hoss, R.P., Yan, Q. (2014) A Depositional and Diagenetic Characterization of the Mt. Simon Sandstone at the Illinois Basin-Decatur Project Carbon Capture and Storage Site, Decatur, Illinois, USA. Illinois State Geological Survey, Prairie Research Institute, University of Illinois. Circular 583. Locke, R.A., Larssen, D., Salden, W., Patterson, C., Kirksey, J., Iranmanesh, A., Wimmer, B., Krapac, I. (2013) Preinjection reservoir fluid characterization at a CCS demonstration site: Illinois Basin–Decatur Project, USA. Energy Procedia 37, 6424–6433. Panno, S.V., Hackley, K.C., Locke, R.A., Krapac, I.G., Wimmer, B., Iranmanesh, A., Kelly, W.R. (2013) Formation waters from Cambrian-age strata, Illinois Basin, USA: Constraints on their origin and evolution. Geochimica et Cosmochimica Acta 122, 184–197. Labotka, D.M., Panno, S.V., Locke, R.A., Freiburg, J.T. (2015) Isotopic and geochemical characterization of fossil brines of the Cambrian Mt. Simon Sandstone and Ironton–Galesville Formation from the Illinois Basin, USA. Geochimica et Cosmochimica Acta 165, 342–360. Labotka, D.M., Panno, S.V., Locke, R.A. (2016) A sulfate conundrum: Dissolved sulfates of deep-saline brines and carbonate-associated sulfates. Geochimica et Cosmochimica Acta 190, 53–71. ), illustrating the long-standing isolation of these brines. Eggenkamp, H.G.M., Coleman, M.L. (2009) The effect of aqueous diffusion on the fractionation of chlorine and bromine stable isotopes.Geochimica et Cosmochimica Acta 73, 3539–3548. Phillips, F.M., Bentley, H.W. (1987) Isotopic fractionation during ion filtration: I. Theory. Geochimica et Cosmochimica Acta 51, 683–695.
) because of (i) the rather homogeneous Cl- and Br- concentration profiles – while both diffusion and ion filtration should conjointly affect isotopes and concentrations; and (ii) the wider variations of δ81Br, expected to be less fractionated than δ37Cl because of the smaller relative mass difference of bromine isotopes. In contrast, these large isotopic variations are associated with remarkably homogenous concentrations and salinities in each of the considered units (only 3 % variations in the Lower unit). This observation, together with the relatively good agreement between the observed δ37Cl-δ81Br regression slope and the theoretical slope predicted for equilibrium between diffusion and gravitation (Fig. 1a), are thus supporting the idea of a long term vertical immobility of the MSS porewaters. ). δ37Cl and δ81Br were measured at IPGP. Errors are reported in 2σ. Fishman, N.S. (1997) Basin-wide fluid movement in a Cambrian paleoaquifer: evidence from the Mt. Simon Sandstone, Illinois and Indiana. In: Montañez, I.P., Gregg, J.M., Shelton, K.L. (Eds.) Basin-Wide Diagenetic Patterns. SEPM Special Publications 57, 231–234. Pollington, A.D., Kozdon, R., Valley, J.W. (2011) Evolution of quartz cementation during burial of the Cambrian Mount Simon Sandstone, Illinois Basin: In situ microanalysis of δ18O. Geology 39, 1119–1122. Al, T.A., Clark, I.D., Kennell, L., Jensen, M., Raven, K.G. (2015) Geochemical evolution and residence time of porewater in low-permeability rocks of the Michigan Basin, Southwest Ontario. Chemical Geology 404, 1–17. Li, Y., Gregory, S. (1974) Diffusion of ions in sea water and in deep-sea sediments. Geochimica et Ccosmochimica Acta 38, 703–714. ), because of NaCl or CaCl2 salt diffusion, they might have distinct diffusion coefficients (see Supplementary Information for additional details), yielding slightly different characteristic times according to Eq. 2. Eggenkamp, H.G.M., Bonifacie, M., Ader, M., Agrinier, P. (2016) Experimental determination of stable chlorine and bromine isotope fractionation during precipitation of salt from a saturated solution. Chemical Geology 433, 46–56.
) and add further support for the continued use of the MSS as CO2 sequestration reservoir. 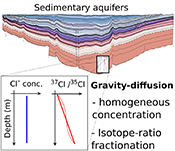 Our study highlights the effect of gravitational settling on isotope distributions in a deep sedimentary formation, revising our fundamental understanding of the complex dynamics and residence time in continental groundwater systems. As a consequence, future studies on crustal aquifers should consider its potential fingerprint on isotope ratios for which the analytical precision is better than the minimum variation expected (i.e. calculated with Eq. 1) and employ a multi-level sampling approach where possible. Where fluid systems are isolated over sufficient periods of time, isotope gravitational settling could be observed. This opens the intriguing possibility that gravitational settling occurs within a wide variety of geological fluids, spanning a wide range of magnitudes. 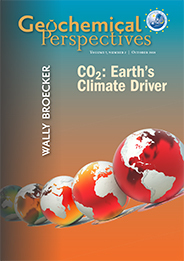 Authors wish to thank Editor Eric Oelkers as well as Ian Bourg and an anonymous reviewer for commenting on this manuscript. Authors also wish to thank P. Cartigny, B. Sherwood Lollar, J.P. Girard, S. Panno and D. Labotka for stimulating exchanges. T.G. thanks J. Labidi, O. Warr, A. Roman and T. Kremer. This work was funded by the ANR CO2FIX (ANR-08-PCO2-003-03) and the IPGP/Ademe/Schlumberger/Total CO2 geological storage program. This is IPGP contribution n° 3873. As a first order estimation, using h = 180 m and D = 2.5 x 10-11 m2 s-1 (effective diffusion coefficient in a sandstone similar to the one in Al et al. (2015), corresponding to a low-end tortuosity factor of ~3, see Supplementary Information for details), we calculate a characteristic time of 4.2 Myr. Long residence time groundwaters revealed by the accumulation of radiogenic noble gases suggest that some aquifers in sedimentary basins remained isolated for millions of years (Marty et al., 2003; Clark et al., 2013), or even billions of years in deeper fracture-controlled systems in crystalline bedrock (Holland et al., 2013). Despite the ubiquitous effects of gravitation on Earth, its potential influence on relative distribution of isotopic substances has remained elusive – and so far only identified in confined gaseous systems (Craig et al., 1988; Severinghaus et al., 1996, 1998). Nor can they result from processes such as pure diffusion (Eggenkamp and Coleman, 2009) or ion filtration (i.e. electrolyte flow forced through a negatively charged membrane such as clay; see Phillips and Bentley, 1987) because of (i) the rather homogeneous Cl- and Br- concentration profiles – while both diffusion and ion filtration should conjointly affect isotopes and concentrations; and (ii) the wider variations of δ81Br, expected to be less fractionated than δ37Cl because of the smaller relative mass difference of bromine isotopes. This model suggests that before cementation, the palaeo-aquifer had a δ37Cl close to -0.4 ‰, therefore in agreement (Eggenkamp et al., 2016) with the evaporative origin inferred from the low Cl/Br ratios (Panno et al., 2013). Given the thickness of the sediment column (~180 m), these variations are typically within the equilibrium range for temperatures between 50 °C (current temperature of the aquifer) and 130 °C (maximal cementation temperature; Fishman, 1997; Pollington et al., 2011) – see Figure 2. Fluid inclusion microthermometry and in situ δ18O analyses of authigenic quartz (Fishman, 1997; Pollington et al., 2011) both support a cementation temperature ranging between 100 and 130 °C in the presence of a brine with a salinity of ~20 % wt. equivalent NaCl (similar to present day salinity in Lower unit). This temperature range was reached at the maximum burial of the MSS, approximately 300 to 350 Myr ago (Fishman, 1997). The MSS is dominantly composed of quartz, with three main lithostratigraphic units (Freiburg et al., 2014): the Lower, Middle, and Upper units. This is significantly above the analytical uncertainties on δ37Cl or δ81Br measurements, respectively of ±0.10 ‰ (Godon et al., 2004; Giunta et al., 2015) and ±0.24 ‰ (Louvat et al., 2016), for 2σ. The potential effects of gravitation on solute distribution have been previously explored to determine if it could influence seawater salinity distribution (Pytkowicz, 1963) or the salinity enrichment with depth (Mangelsdorf et al., 1970) often observed in sedimentary basins (Kharaka and Hanor, 2003). While the Upper unit has been shown to have experienced minor dilution (Panno et al., 2013; Labotka et al., 2015), both Upper and Lower porewaters were recently interpreted as dominated by modified Cambrian seawater (Labotka et al., 2016), illustrating the long-standing isolation of these brines. Table 1 [...] All data except the δ37Cl and δ81Br were measured at the ISGS (Panno et al., 2013; Labotka et al., 2015). These conclusions are consistent with the Cambrian age origin of these fluids (Labotka et al., 2016) and add further support for the continued use of the MSS as CO2 sequestration reservoir. For instance, while Cl- and Br- have almost identical self diffusion coefficients in water (Li and Gregory, 1974), because of NaCl or CaCl2 salt diffusion, they might have distinct diffusion coefficients (see Supplementary Information for additional details), yielding slightly different characteristic times according to Eq. 2. However, the accuracy of this technique depends on the estimation of crucial parameters such as the average porosity, the content of radioactive elements (U, Th and K) within host rocks, as well as assuming a closed system (Lippmann et al., 2003). Porewaters were sampled through a single, multi-level observation well (Locke et al., 2013) at two and six discrete depths in the Upper and Lower units, respectively (the low permeability of the Middle unit precluded sampling). At equilibrium, the vertical distribution of a solute concentration Ci reaches a Boltzmann distribution such as Ci ∝ e-EiRT where R is the ideal gas constant, T is temperature (°K) and Ei is the gravitational potential energy corrected for buoyancy expressed as Ei = (Mi – ρV̄i)gz (Pytkowicz, 1963), where Mi is the molar mass (kg mol-1), ρ is the density of the fluid, V̄i is the partial molar volume (m3 mol-1), g is the acceleration of the Earth's gravitational field (m s-2), and z is the depth (m). Here we expand upon the largely ignored historic concept of solute gravitational settling within a static water column (Russell et al., 1933) and present the first evidence that isotopic ratios can be affected by it, providing a new tool to constrain the degree and timing of isolation for sedimentary aquifers. Chlorine stable isotope compositions were measured on CH3Cl gas in a dual-inlet gas source mass spectrometer (Thermo Delta plus XP, Finnigan at Institut de Physique du Globe de Paris). We followed the classical method described by Kaufmann et al. (1984); Long et al. (1993). Dissolved chloride (Cl-) is first precipitated as silver chloride (AgCl) and then reacted with CH3I to quantitatively produce a CH3Cl gas that is introduced in the mass spectrometer. Chlorine stable isotope variations are usually reported versus the Standard Mean Oceanic Chloride (SMOC), using the delta notation as follows: δ37Cl = [(37Cl/35Cl)samp/(37Cl/35Cl)SMOC − 1] x 1000, and are expressed in per mille. In the course of this study, the external reproducibility on a seawater international standard was better than ±0.1 ‰ (2σ, n = 25). Bromine stable isotope composition was measured following the method fully described in Louvat et al. (2016). Dissolved bromide (Br-) is extracted by ion exchange chromatography with NH4NO3 and is measured on a Neptune Plus Multicollector ICPMS in wet plasma conditions. Bromine stable isotope composition is usually reported versus the Standard Mean Oceanic Bromide (SMOB), using the delta notation as follows: δ81Br = [(81Br/79Br)samp/( 81Br/79Br)SMOB − 1] x 1000, and are expressed in per mille. In the course of this study, the external reproducibility on SMOB was better than ±0.24 ‰ (2σ, n = 20). where D0A and D0C are the respective self diffusion coefficients of A and C, and ZA and ZC their respective charges. In the case of the Mount Simon brines, the self diffusion coefficient of Cl- (2 × 10-9 m2 s-1 at 25 °C) the dominant anion, is therefore decreased by the dominant co-diffusing cations Na+ and Ca2+ which both have lower self diffusion coefficients (respectively of 1.3 and 0.7 × 10-9 m2 s-1; Li and Gregory, 1974). Importantly, a trace element existing in a saline solution will tend to follow its self diffusion coefficient as the concentration of existing counter-ions are high enough in solution (Li and Gregory, 1974). This will be the case for Br- in the Mount Simon brines which should therefore diffuse as a solitary ion (2 × 10-9 m2 s-1 at 25 °C). where D0i is the free water diffusion coefficient of a dissolved species i, Dei is the “effective” diffusion coefficient of this same species in the given porous media, and ϕ is the accessible porosity of the media. In a porous water column such as a sedimentary aquifer, the characteristic time to reach equilibrium should therefore be calculated (Eq. 2) by using the effective diffusion coefficient. Since no diffusion experiments have been conducted in rock cores from the Mount Simon Sandstone we defined the effective diffusion coefficient as D0i / Dei = 100. This reducing factor of 100 is consistent with the effective diffusion coefficient of chloride recently proposed for basal Cambrian sandstone in Southwest Ontario (Al et al. (2015)). Given the porosity of the Mount Simon (0.1–0.15), this effective diffusion coefficient would correspond to a tortuosity factor of ~3. 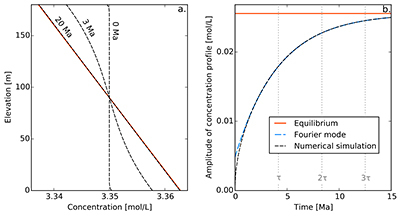 In a still and homogeneous water column, molecular diffusion tends to distribute solutes evenly. The Earth’s gravitational field, on the other hand, concentrates species denser than the surrounding fluid in the lower part of the fluid. From that standpoint, a solute in an ideal water column is analogous to gas in the atmosphere, or to a heavy isotope in a centrifuge (Perrin, 1916). In this section, following (Pytkowicz, 1963; Mangelsdorf et al., 1970; Bons and Gomez-Rivas, 2013), we propose a simple model for the settling of isotopes in an aquifer, and use it to evaluate the characteristic time over which gravity induces a stratification of the isotopic ratio. We first consider the statistical equilibrium of solutes in a water column, and express the associated stratification in terms of the Boltzmann distribution (see A.4.1). Next we consider the dynamics of gravity-induced settling in a homogeneous water column. The equilibrium distribution resulting from these dynamics, when compared to the Boltzmann distribution, relates the diffusion coefficient to the settling velocity of the solute (see A.4.3). We then propose to extend this reasoning to aquifers, and discuss the role of the matrix tortuosity on the dynamics of gravity-induced settling (see A.4.4). Finally, we use this theory to evaluate the characteristic settling time of isotopes in an aquifer. where NA is the Avogadro constant, and C0 a normalisation constant inherited from the initial solute distribution. We find hc ≈ 20 km for chloride, and hc ≈ 5 km for bromide (Table S-1). Such large values make gravitational settling hardly visible for concentration measurements in aquifers. For instance, over the thickness of the Lower Mount Simon aquifer (h ≈ 180 m), the relative variation of chloride concentration would be h/hc ≈ 1 % at equilibrium (about 4 % for bromide). The precision of our concentration measurements do not allow us to identify gravity settling in the Mount Simon aquifer (Figs. 2 and 3 in the main text). A.4.2 Distribution of isotopic ratio. When two stable isotopes coexist in the same water column, they settle independently in the gravity field until they reach thermal equilibrium. At this point, we expect the heavier isotope to be more concentrated near the aquifer’s bottom than its lighter counterpart. We thus anticipate the isotopic ratio to vary, albeit faintly, over the depth of an aquifer at equilibrium. To estimate the impact of gravity-induced settling on the vertical distribution of an isotopic ratio, we simply evaluate the equilibrium distribution of each isotope using Eq. S-4, and calculate the corresponding isotopic ratio. The partial molar volume corresponds to the contribution, per mol added of the species, to the overall volume of the solution. For a given species, this parameter depends on the temperature of the solution as well as on the nature of the electrolyte (other species present in solution and their respective concentrations) and is not trivial to define. Few studies have focused on differentiating partial molar volume between isotopic substances. Essentially, the volume of an atom/ionic species is defined by its electronic structure, which should not vary from an isotope to another. Hamann et al. (1984) have measured some isotopic volume increases in cubic crystals at 300 °K, during substitution of 6Li to 7Li (+0.017 × 10-6 m3 mol-1), of H to D (+0.14 × 10-6 m3 mol-1) or of 32S to 34S (+0.0013 × 10-6 m3 mol-1). These variations of volume, although they were not determined for liquid solutions, are extremely small and are therefore not likely to result in significant changes of partial molar volume between the isotopes of chloride (21.6 × 10-6 m3 mol-1) or bromide (28.5 × 10-6 m3 mol-1) (Durchschlag and Zipper, 1994). This expression corresponds to Eq.1 in the main text. which is about 140 km for isotopes differing by two neutrons. In the Lower Mount Simon aquifer, we therefore expect the relative isotopic ratio of such isotopes to vary by about h/hR ≈ 1.4 ‰. The resolution of modern mass spectrometers allows for such precision (Figs. 2 and 3 in the main text). A.4.3 Gravity and diffusion. At equilibrium, gravity and molecular diffusion balance each other to maintain the vertical stratification of the solution. However, even a still aquifer needs not be at equilibrium, as the balance between gravity and diffusion requires time to establish itself. When discussing the implication of field observations in terms of gravity settling, we therefore need an estimate of the characteristic time over which the stratification takes place. To do so, we propose a simple one dimensional model. We first return to a still water column, in the absence of any porous matrix. Assuming, for simplicity, that the solute concentration depends on elevation only, its gradient generates a vertical diffusion flux −D0∂C/∂z, where D0 is the diffusion coefficient of the solute in free water. We can measure its value in laboratory experiments (Table S-1). This flux tends to homogenise the solution. Conversely, gravity pulls denser solutes downwards at velocity V0, thus inducing a convective flux −V0C which concentrates the solute near the aquifer’s bottom. For illustration, the settling velocity of chloride in free water is about 0.03 μm yr-1 (Table S-1). In an aquifer, the porous matrix complicates gravity settling. Molecular diffusion and gravity settling still occur within the pores, but it is unclear how the porous matrix affects these processes at the macroscopic scale (Whitaker, 1967; Koch and Brady, 1987). As a reasonable approximation however, diffusion at the macroscopic scale is often modelled as linear diffusion, using an effective coefficient De that accounts for the effects of tortuosity. Again, we do not know if this model is an accurate representation of gravity settling in an aquifer. It is, however, the only macroscopic model preserving the form of Eq. S-9 that is compatible with laboratory measurements of the diffusion coefficient, and that reaches statistical equilibrium in steady state. Being second order in space, and first order in time, Eq. S-11 requires two boundary conditions and an initial condition, all of which vary with the specifics of the aquifer they represent. Here, we propose a simple set of boundary and initial conditions, in tune with the order of magnitude model presented in this section. Finally, for illustration, we assume that the solute was uniformly distributed at the time of the aquifer’s emplacement, which we define to be t = 0. Strictly speaking, this initial condition is not compatible with the boundary conditions. However, this issue is easily worked around by adding an infinitesimal boundary layer near the aquifer’s boundaries. Figure S-1a shows a numerical simulation of this system, for typical values of the diffusion coefficient, settling velocity and temperature of the LMS aquifer. As expected, the concentration profile departs from its homogeneous initial condition to concentrate more solute near the aquifer’s bottom. After a few tens of million years, the concentration profile is virtually indistinguishable from the Boltzmann equilibrium. A.4.5 Characteristic settling time. To characterise the relaxation of the concentration profile towards the Boltzmann distribution, we first plot the evolution of the amplitude of the concentration profile, C(z = 0) − C(z = h) as a function of time (Fig. S-1b). After a short transient, this amplitude relaxes exponentially towards its equilibrium value. This behaviour is expected, as Eq. S-11 and its boundary conditions are linear. The Einstein-Smoluchowsky equation allows us to identify the ratio De/Ve with the characteristic length hc defined by Eq. S-5. Therefore, the first mode is simply the Boltzmann distribution. where i = √−1 is the imaginary number and n is a positive, non-vanishing integer. Regardless of the wave number kn, the associated growth rate σn is a negative real number. Therefore, all modes decay exponentially after the emplacement of the aquifer, except for the 0-th mode which corresponds to statistical equilibrium. The higher the order n of a mode, the faster it decays. Apart from the zeroth-order mode, the longest living mode corresponds to n = 1. It is the most likely to appear in field data. This expression, which corresponds to Eq. 2 in the main text, indicates that the settling velocity does not influence significantly the characteristic time, provided the aquifer is shallow enough. Numerically, we find a characteristic time of about 4.2 Myr for chloride in the LMS aquifer. In a shallow aquifer, the equilibrium concentration is essentially linear, and the most long lived mode is a cosine whose wavelength is twice the aquifer’s depth. In the LMS aquifer, this approximate solution is virtually indistinguishable from the numerical solution, except immediately after the aquifer’s emplacement (Fig. S-1). Not surprisingly, the relative isotopic ratio vanishes when the aquifer is too shallow (h << hR), indicating a virtually homogeneous isotopic profile. More remarkably, ∆R does not depend on the distance between samples z1 − z2 only, but only on the absolute elevation of the samples above the aquifer’s bottom. At long times however (t >> τ), this peculiarity fades away, as the relative isotopic ratio returns to its equilibrium profile. The Illinois Basin is an intra-cratonic basin of ~150000 km2 which covers most of Illinois as well as parts of Kentucky, Indiana and Tennessee. It was formed during a rifting event in the early Cambrian and is now bound on the North by the Kankakee, the Mississippi River and the Wisconsin arches and on the South by the Cincinnati and the Pascola arches (Fig. S-2). The Basin is composed of Palaeozoic marine sediments ranging from Cambrian to Carboniferous and essentially consists of alternating clay-rich shale formations and sandstone units. The Mount Simon Sandstone is the deepest and less accessible formation of the Illinois Basin and reaches a maximum depth of 4300 m in Southern Illinois (Willman et al., 1975). It unconformably lies on the Precambrian crystalline basement (a low permeability structure composed of granite, granodiorite and rhyolite). The Argenta Sandstone formation is sometimes identified as a singular pre Mount Simon unit lying in between the basement and the Mount Simon Sandstone. In this study, because of the relatively poor thickness (few metres at most) of the Argenta formation, we made no distinction between the Mount Simon and the Argenta Sandstone. 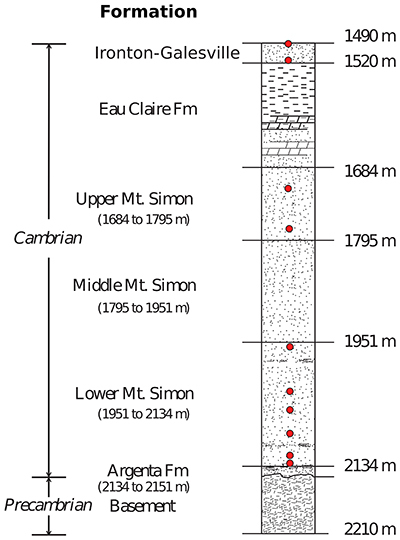 The petrographic study of the core allowed to distinguish three units in the Mount Simon Sandstone (Freiburg et al., 2014): the Lower Mount Simon (LMS) lying between depth -2130 m to -1955 m, is characterised by fluvial deposits and is considered as a high quality reservoir rock with 25 % log-porosity and 884 mD log-permeability; the Middle Mount Simon (MMS) occurring between depth -1955 m to -1785 m, has a porosity largely filled with diagenetic quartz and K-feldspar cementation which has resulted in a decrease of log-porosity to 12 % and of the log-permeability to 44 mD; the Upper Mount Simon (UMS) occurring from depth -1785 m to -1690 m, consists of intertidal sandstone and interbedded shale deposits and has a log-porosity of 15 % and log-permeability of 184 mD. The mechanism and the nature of the fluid responsible for the cementation observed in the Mount Simon, mostly in the MMS, has been debated in recent years. Some authors have suggested a basin scale north to south circulation of a warm fluid (Chen et al., 2001) consistent with the 100–130 °C fluid inclusion temperature of homogenisation (Fishman, 1997); but a more recent in situ δ18O-microanalysis study on quartz cements (Pollington et al., 2011) indicates that the cementation is more likely due to the burial of the Mount Simon Sandstone in presence of a brine with 20 % NaCl equivalent salinity. Brines from the Cambrian strata in the Illinois basin have been sampled and characterised only recently by Locke et al. (2013), Panno et al. (2013) and Labotka et al. (2015). The Mount Simon Sandstone porewaters were sampled at 2 discrete levels in the Upper Mount Simon, and at 6 in the Lower Mount Simon. The shallower Ironton-Galesville sandstone was also sampled at 2 different levels (see Fig. S-3). Chloride and bromide are conservative species in water. Because they are trace elements in sedimentary rocks that are not evaporitic, the Cl/Br ratio of a saline fluid is often considered as being inherited from the process that led to its salinity increase. Chloride and bromide are differently partitioned into alkali salts, of which the most common is halite (NaCl). Thereby, a fluid with a Cl/Br ratio lower than the seawater Cl/Br ratio (646) is usually interpreted as a seawater-like fluid that has evaporated up to halite saturation. By contrast, a fluid with a Cl/Br ratio above the seawater ratio is usually interpreted as resulting from the dissolution of evaporites (which must be dominated by halite and therefore poor in Br). Based on Cl/Br ratio interpretations, Panno et al. (2013) have thus suggested that both Mount Simon and Ironton-Galesville Sandstone brines must predominantly derive from a primary evaporative fluid (Cl/Br < 600). The fact that Cl− and Na+ concentrations are now far from the NaCl-saturation (≈360 g/L at 20 °C) indicates that primary evaporative fluids have been subsequently diluted (with groundwater or meteoric water or even seawater). However the evaporative scenario remains problematic for explaining high salinity porewaters in the Illinois Basin, since no substantial evaporite units have been found in the Basin. Panno et al. (2013) thus suggested that these brines formed outside of the basin and later migrated into the Illinois Cambrian strata. Panno et al. (2013) also pointed out the similarity of the brine’s Na/Br ratios with that of crystalline brines from the Canadian Shield, possibly indicating a crystalline basement contribution, also supported by the brine’s radiogenic 87Sr/86Sr signature (Labotka et al., 2015). The uppermost Ironton-Galesville Sandstone aquifer has a distinctly higher Cl/Br ratio. This indicates that the main brine contributor for the Ironton-Galesville aquifer is probably a different primary evaporative brine. Its higher Cl/Br ratio would then indicate a lower extent of Cl precipitation into NaCl and therefore a lower extent of palaeo-seawater evaporation. This observation, together with chlorine and bromine isotope compositions (Table S-2), strongly suggest that the Eau-Claire Shale is preventing hydrogeological connection between the two Cambrian sandstones (Fig. S-4). Figure S-2 (a) The Illinois Basin (bright coloured) and the different geological structures surrounding it. Decatur is the location chosen for the CO2 sequestration project and is therefore the location of the multi-level observation borehole where porewaters were sampled. (b) Geological cross section of the Illinois Basin between A and A’. The Mount Simon Formation corresponds to the deepest strata of the Cambrian units. Figures modified after Panno et al. (2013). Bons, P.D., Gomez-Rivas, E. (2013) Gravitational fractionation of isotopes and dissolved components as a first-order process in crustal fluids. Economic Geology 108, 1195–1201. Chen, Z., Riciputi, L.R., Mora, C.I., Fishman, N.S. (2001) Regional fluid migration in the Illinois basin: Evidence from in situ oxygen isotope analysis of authigenic K-feldspar and quartz from the Mount Simon Sandstone. Geology 29, 1067–1070. Durchschlag, H., Zipper, P. (1994) Calculation of the partial volume of organic compounds and polymers. In: Lechner, M.D. (Ed.) Ultracentrifugation. Steinkopff, Darmstadt, 20–39. Eggenkamp, H.G.M., Coleman, M.L. (2009) The effect of aqueous diffusion on the fractionation of chlorine and bromine stable isotopes. Geochimica et Cosmochimica Acta 73, 3539–3548. Epstein, N. (1989) On tortuosity and the tortuosity factor in flow and diffusion through porous media. Chemical Engineering Science 44, 777–779. Hamann, S.D., Shaw, R.M., Lusk, J., Batts, B.D. (1984) Isotopic volume differences: The possible influence of pressure on the distribution of sulfur isotopes between sulfide minerals. Australian Journal of Chemistry 37, 1979–1989. Kaufmann, R., Long, A., Bentley, H., Davis, S. (1984) Natural chlorine isotope variations. Nature 309, 338–340. Koch, D.L., Brady, J.F. (1987) A non-local description of advection-diffusion with application to dispersion in porous media. Journal of Fluid Mechanics 180, 387–403. Li, Y., Gregory, S. (1974) Diffusion of ions in sea water and in deep-sea sediments. Geochimica et Cosmochimica Acta 38, 703–714. Locke, R.A., Larssen, D., Salden, W., Patterson, C., Kirksey, J., Iranmanesh, A., Wimmer, B., Krapac, I. (2013). Preinjection reservoir fluid characterization at a CCS demonstration site: Illinois Basin Decatur Project, USA. Energy Procedia 37, 6424–6433. Long, A., Kaufmann, R.S., Martin, J.G., Wirt, L., Finley, J.B. (1993) High-precision measurement of chlorine stable isotope ratios. Geochimica et Cosmochimica Acta 57, 2907–2912. Perrin, J. (1916) Atoms. D. Van Nostrand Company, New York. Pollington, A.D., Kozdon, R., Valley, J.W. (2011) Evolution of quartz cementation during burial of the Cambrian Mount Simon Sandstone, Illinois Basin: In situ microanalysis of 18O. Geology 39, 1119–1122. Richter, F.M., Davis, A.M., DePaolo, D.J., Watson, E.B. (2003) Isotope fractionation by chemical diffusion between molten basalt and rhyolite. Geochimica et Cosmochimica Acta 67, 3905–3923. Robinson, R.A., Stokes, R.H. (1959) Electrolytic solutions. Butterworths Scientific Publication, London. Willman, H.B., Atherton, E., Buschbach, T.C., Collinson, C.W., Frye, J.C., Hopkins, M.E., Simon, J.A. (1975) Handbook of Illinois Stratigraphy. Bulletin no. 095. Illinois State Geological Survey, Urbana, Illinois. Whitaker, S. (1967) Diffusion and dispersion in porous media. AIChE Journal 13, 420–427.